A new iconic residential Burnaby high-rise tower is now previewing at the Polygon Midori Metrotown condo project brought to you by our favourite multi-family builder in the Lower Mainland. Located centrally in the heart of the Metrotown Burnaby real estate district, Midori by Polygon’s address will be 6579 Malborough Avenue Burnaby, BC. The meticulous and unique architectural design of this iconic tower is by DYS Architecture and will make a welcome contribution to the growing Metrotown community in Burnaby. The graceful curves and green leaf motif is clearly different from the cookie-cutter high-rises that have cropped up over the past decade in this neighbourhood. The presale Burnaby Midori condos will be situated in an established community with tree lined streets and beautifully conceived lush outdoor spaces. The arrival and over height lobby will welcome both residents and visitors to this beautiful structure. Polygon Midori condos in Burnaby will be located just steps away from the world famous Metropolis at Metrotown, the extensive Lower Mainland SkyTrain network as well as the Bonsor Park and Recreation Complex. At Metrotown and in the surrounding neighbourhood, the presale Burnaby Midori condo tower will be close to a wealth of international cuisine, world class shopping, great schools and community amenities. The dramatic entrance area will include a beautiful canopy and calming water feature, lush landscaping and signature trellis structures in the courtyard. As well, the lobby entrance will feature custom metal and glass doors, lighting features and a grand foyer with a luxurious seating area. For more information about the Midori Metrotown condos, please visit the Polygon web site at www.polyhomes.com today. 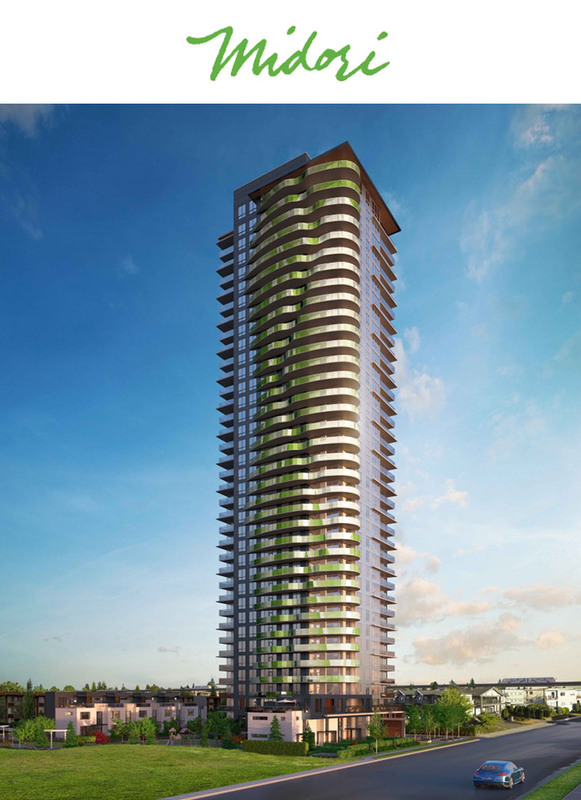 The iconic Burnaby high-rise will feature impressively designed 2 bedroom residences starting from the mid $400’s. The floor plans allow for generous living spaces that flow out to large balconies and the long list of thoughtful interiors is sure to impressive home buyers. Two bedroom Burnaby condos start from just $439,900 with grand opening presales happening right now! The floor plans over nine hundred square feet include Plan A (907 sf), Plan C (950 sf), Plan E (934 sf) and Plan F (922 sf). There are also multiple two bedroom/2 bathroom layouts at Midori Burnaby condos that range from 809 square feet to 877 square feet that include Plan B (811 sf), Plan D (877 sf), Plan G (866 sf) and Plan H (809 sf). All homes have insuite laundry as well as outdoor living spaces. The floor plans that are along the ‘curved’ architectural side of the tower includes Floorplans C, D and F.
The beautifully designed Polygon homes at Midori Metrotown condos are clearly unique and contemporary with solid wood doors, richly stained and polished chrome hardware in addition to over height 8 foot six inch ceilings in the main living areas. As well, the residences will have carerra style interior doors that are two paneled and have polished chrome levellers, 3 distinct and beautiful interior designed selected colour schemes (called Parisian Snow, Milanese Sunset and New Yorker Night) as well as beautiful wood style laminate floors in the living space, and white plush carpets in the bedrooms for added comfort. 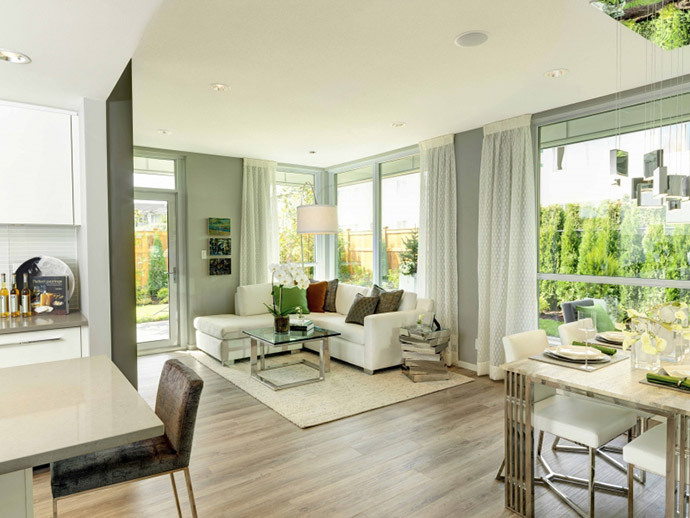 Other signature home features at the presale Burnaby Midori condos in Metrotown includes expansive low E windows that are energy efficient, sound proof and will be finished with vertical blinds. 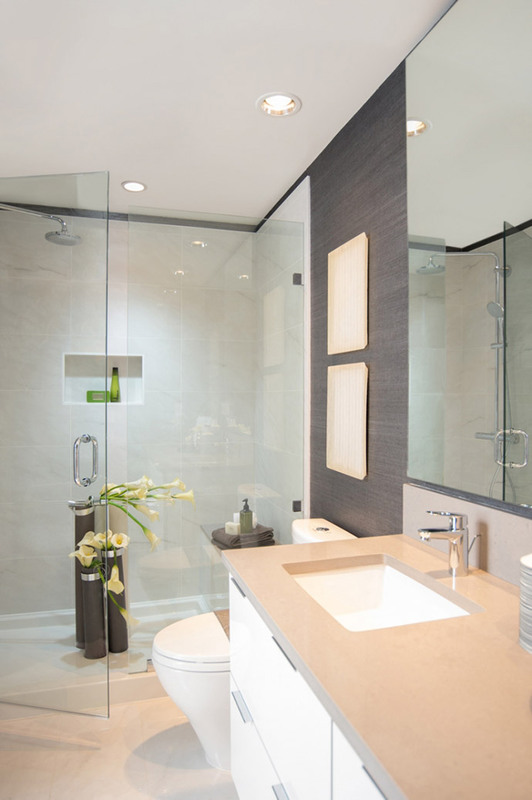 The designer bathrooms will feature master ensuites with oversized vanity mirrors, recessed lights and convenient under mount sinks in addition to most ensuites offering oversized spa style shower head and frameless shower door, integrated bench seating and built in niches. Some ensuites will also feature deluxe linen closet for extra storage. The presale Burnaby Midori condos will also feature second bathrooms with contemporary rectangular soaker tub with unique polished chrome fixtures in most homes. All bathrooms will feature dual flush toilets as well as engineered stone counters/backsplashes, porcelain tile flooring and flat panel floating custom cabinetry with modern pulls and soft close hardware. The chic kitchens at Midori Burnaby condo tower will feature a quality appliance package including a 30” fridge/bottom mount freezer integrated with custom cabinetry, 30” wide gas cooktop and self cleaning wall oven, top mounted control EnergyStar rated dishwasher that is also fully integrated with custom cabinetry in addition to a built-in microwave and convenient hood fan with 3 speed slide control. Other kitchen features include an undermount double bowl sink (stainless steel finish) with single lever faucet and telescopic vegetable spray, soft close cabinetry hardware, roll out spice rack and built in recycling station. There is recessed lighting under the stylish and contemporary flat panel custom cabinetry. 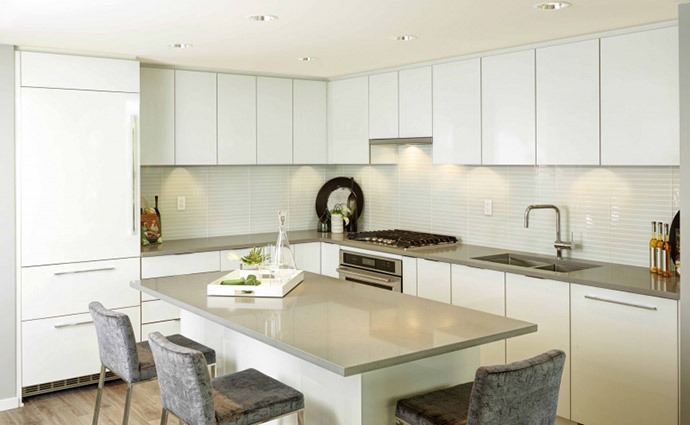 The presale Burnaby Midori Metrotown condos will also feature engineered stone counters and full height tiled backsplash. For additional details about Midori by Polygon, please visit their web site at www.polyhomes.com.